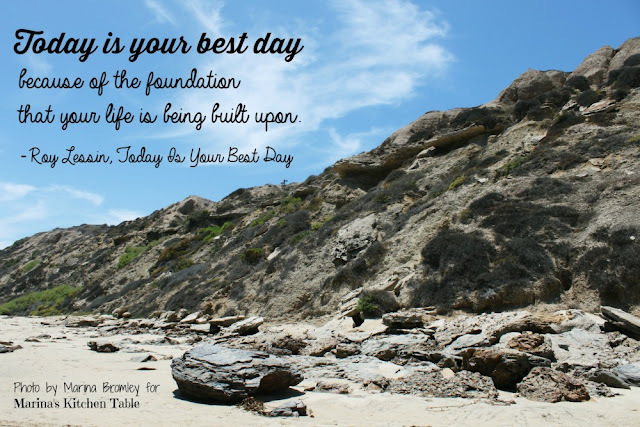 Today is your best day because of the foundation that your life is being built upon. I recently watched a documentary about the construction work that is taking place around the San Francisco Bay area. Many of the large structures that were built over sixty-five years ago are being reinforced to be able to withstand a massive earthquake. One of the buildings in need of strengthening is the prison on Alcatraz Island. The person in charge of this project stated that the best way to secure the building is to anchor it deep into the very rock that it was built upon. The Bible tells us that one day everything upon this earth will be shaken. This shaking will be more powerful than any known earthquake that has ever been recorded or can even be imagined. When this shaking takes place, the only things that will remain are eternal things. The eternal things that remain are stronger and more secure than the rock upon which Alcatraz stands. Jesus said that the only way a person's life can be secure is to build it upon Him and His words. He is the solid foundation of your faith and the rock upon which you stand. The Psalms often remind us of the importance of having God as our rock, our refuge, our security, and our strength. When you cry out to God in time of trouble, He will be your rock of deliverance and He answers your prayer and calms your heart. What is your heart's response to God today? Let it be one of praise, glory, and thankfulness. Because God is who He is, you can stand sure today without fear of anything under you slipping away. Hear the words of the psalmist when he proclaims, "The Lord is my rock, my fortress, and my savior; my God is my rock, in whom I find protection. He is my shield, the strength of my salvation, and my stronghold" (Psalm 18:2 NLT).